American Heritage knows exactly which billiards accessories are most beloved by pool table enthusiasts. The Designer Accessory Kit includes all of the accessories that pool table owners often purchase over a span of several months. This package will relieve those headaches of multiple store visits later. 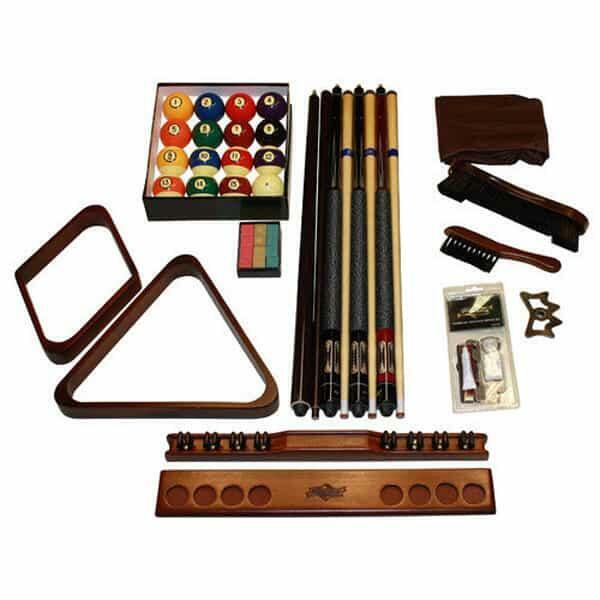 The package includes thirteen accessories, including four high-quality maple pool cues, a deluxe set of billiards balls, two ball racks, a deluxe cue kit for maintenance and re-tipping, a vinyl cover for pool table protection, a bed brush and rail brush, a box of pool cue chalk, a bridge head and stick combination, and a two-piece wall rack to keep it all organized. Enjoy the fruits of your careful forethought with a full-bodied package of accessories by American Heritage.